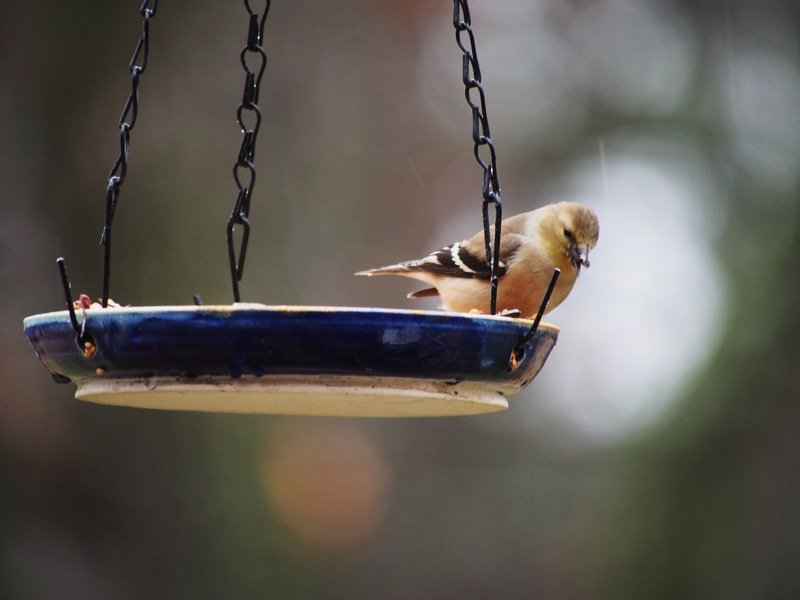 This entry was posted in birds, Ozarks, Photography, wildlife and tagged American Goldfinch, Badass Goldfinch, Olympus, Olympus E-M5, Ozarks, photography, Rain, Winter by artsifrtsy. Bookmark the permalink. 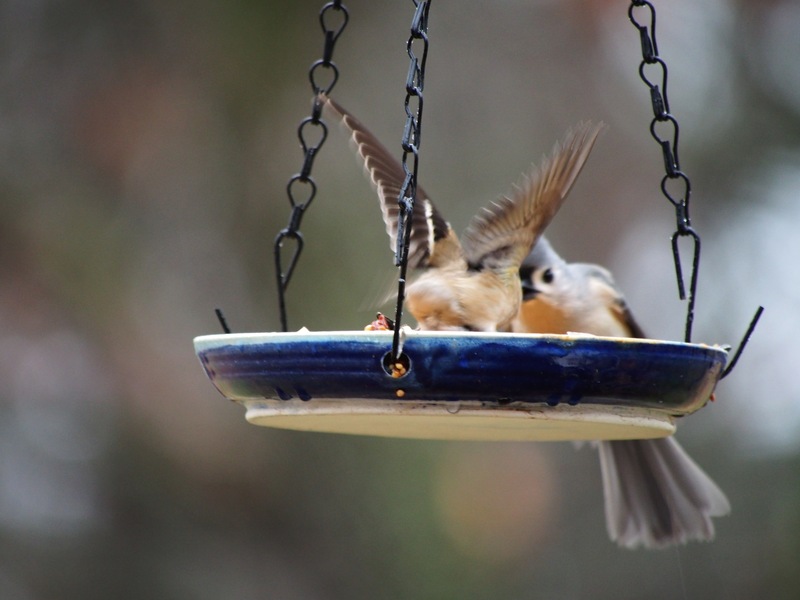 I love him too – he is owning that feeder! Sometimes we actually under estimate the power of the little guy with small man syndrome… great set of photos… whilst away I saw a fork tailed drongo chasing a yellow billed kite off a particular patch of grass where the smaller bird was feeding on the insects… the Kite obviously flew in to see what was available and got chased off by the little guy…. So true – sometimes the little guys are the ones who will hold their ground. I love it when the little guy finishes first! Wonderful – I don’t think of them as tough at all — but we don’t have a tray feeder so I think that they don’t need to fight for stuff. I would have guessed the bluejay. Nasty birds in spite of how pretty. 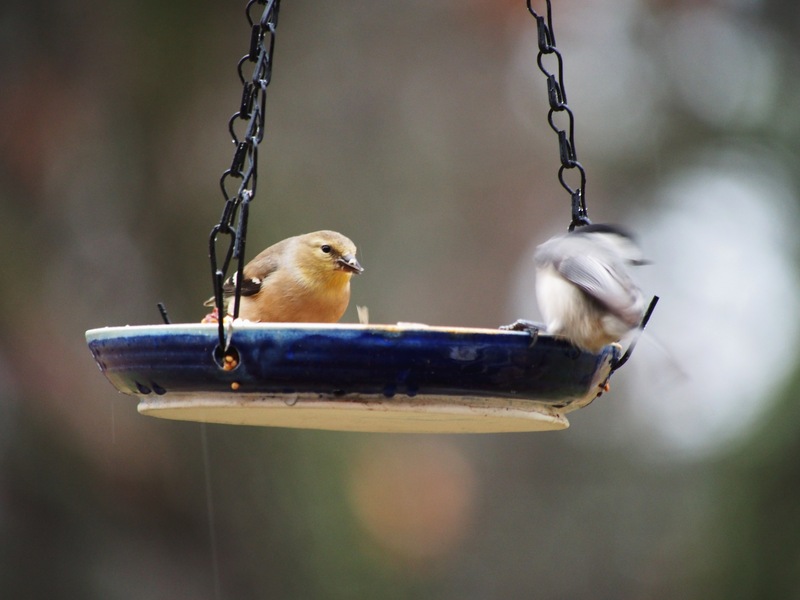 You know it started with the tray feeder – now they are terrorizing the chickies on the sunflower feeders too – cute yellow monsters! I don’t have jays at my feeders – I see them close by, maybe they are afraid of the goldfinches. Sure is one tough little bird, Lorri. Love the images and like you, find it pretty hard to catch the action in a photo, but oh so much fun in trying. Nice to share the action with others via our blogs. Aren’t we lucky to be able to photograph the Natural world around us to share. We sure are lucky Vicki. I rarely shoot fast enough to stop flight – my lens is not really fast enough to do that this close, but it is fun to try. Thanks, mine are not eating much thistle either right now. I haven’t seen fights before today. All is well here in Eureka – I have been on the road and it’s good to be back! I don’t have any goldfinches here that I know of. Tough little guy. haha! here it’s a sparrow, at least I think it’s a sparrow. It’s small and brown with a rosey colored chest and chin so not sure what it is, but it’s bossy! These fellas are usually ground feeders and very passive – this guys the alpha finch! My sparrows don’t usually get near the feeder. I finally looked up the bird that comes to the feeder, it’s a house finch, which I usually only see in winter time. It comes with a big bunch of females and males. They sing really pretty songs too. The sparrows here are at my feeders all the time. I haven’t seen many birds since the falcon came to visit though. Ahhh – we have house finches in this area in the summer, but I’ve never had them at my house. They have a great song. I did see a sparrow in the mix on the ground today before the sun went down. Go figure. Thanks for the headsup! I’ll be steering clear of ’em! holy cow, who knew? When I die, I’m coming back as a goldfinch! 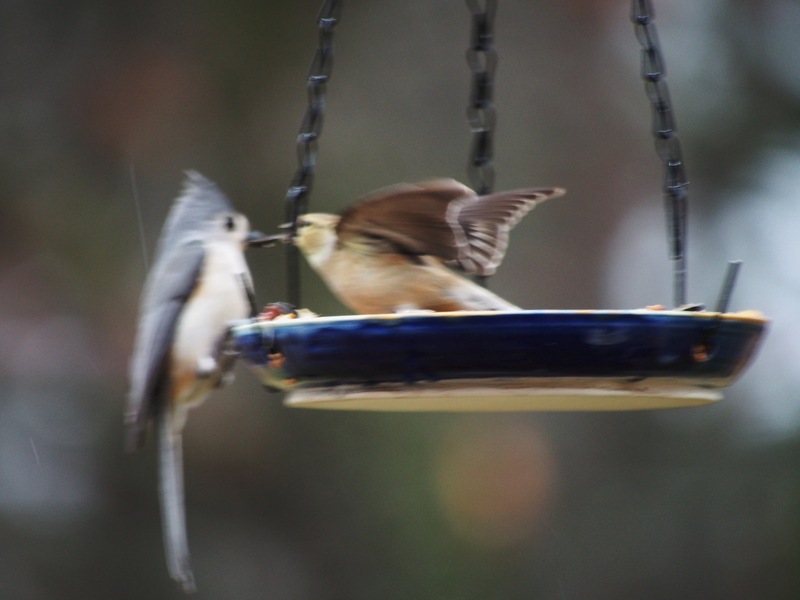 I wouldn’t have thought a goldfinch would be able to chase off a titmouse like that. Our goldfinches (so far) don’t even come to the feeders. I see them out in the fields eating seeds so there still must be plenty to eat out there. I was totally surprised by this guy. I have a finch feeder but they have been eating out of this tray and the sunflower seed feeders the last couple of weeks. They are feeding on the ground too, but this fellow likes bigger seeds. He is such a stud! You can tell he knows it too!